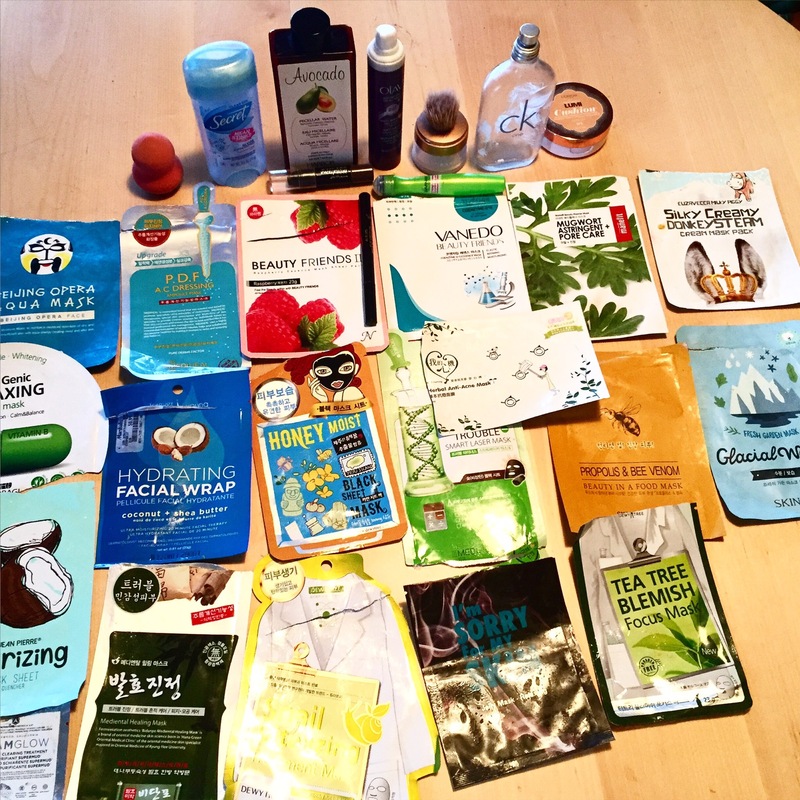 Here is round two of my monthly empties. Sorry it took awhile to get this post up, there was a ton of stuff to report on! This mask had so much essence. It was made of a thin material and fit my face really well. It was my first time trying this brand of masks but will I def repurchase. The mask stayed wet for an hour, and was still wet when I took it off. I squeezed more essence out onto my hands and rubbed it onto my face. My blemishes were pretty much gone the next morning and my face was so incredibly soft. I am linking to a similar mask at Misstutii. Use this code for 10% off! This mask was the first dual step mask I tried. The first step is a base ampoule. The second is a black mask that is highly saturated and fit my face well and adhered well. The mask had a general clean smell and left my face feeling soft. I am linking to this mask at Skin18.com. Use this link for a discount! This mask definitely had a coconut smell. It was highly soaked and I could feel some essence soaking into my skin This mask was worth the dollar at Marshalls/TJ Maxx where I found it. My skin was softer after use and this mask was just your typical moisturizing mask. This mask smells amazing like lavender!! The mask has a strong scent if you don’t like that then this is not for you. It has tons of jelly essence that I used for days afterwards. I love these jelly masks. It lasted for over an hour and would have lasted longer but I took it off. Skin was instantly softer afterwards. I would definitely repurchase this. This was mask was gifted by a friend. The cotton was a thicker material, but it was so soft and sadly it didn’t smell much like coconut. Dried out after the usual 20-30 mins. It was a typical moisturizing mask. This mask was covered in essence. It was made of a thinner cotton and didn’t have much of a scent. I used when I had an under surface blemish and it helped to clear it up. Use this link for a discount! I used this when I had a huge under the surface blemish. It is made of a thinner cotton and tingled. The mask smells similar to tea tree. I had softer skin and the blemish was slightly smaller. This mask from Misstutii is similar. Use this link for 10% off your purchase there! I love My Scheming masks and I will do an entire post on this brand of masks soon. This mask was made of a thinner cotton and smelled like fresh green tea. It was highly saturated and fit well. The mask slightly brought down the swell of the pimple I had when I used it. I would repurchase these again. This mask fit well and had lots of essence. It had a typical essence smell and was nicely saturated. It was made of a thinner cotton and soaked in well and dried quickly. My skin felt firmer after use. Use this link for 10% off! This mask left my skin feeling soft. It was your typical sheet mask thickness, and had a clean essence smell. The fit was good. Use this code for 10% off! All of the masks below can be found on Memebox.com. Use this code for 20% your first purchase of $25 or more! I was hoping this would’ve smelled like of honey but it had typical clean sheet mask essence smell and I was disappointed because I love the smell of honey. Otherwise, in terms of performance it was filled to the max with essence. It had a bit of an awkward fit but it left my face feeling super soft. I am linking to a Similar Mask from Dewy Tree. Yay! This mask is currently on sale at Memebox. If you use this plus the additional 20%off code I linked above, you’re saving almost 75%! I used this when I was trying to get rid of a huge surface pimple which was so stubborn. The mask was made of a thicker cotton and fit well. It was super saturated and did not have much of a scent. This mask really helped to reduce the blemish, and I already ordered another 5 because I liked it so much for pimple flair ups in the future. Finally a mask that smells slightly like honey! I’m obsessed with honey so I am super excited about this one! The mask also had a perfect fit on my face. It’s on the thicker side, and had the perfect amount of essence. I will definitely repurchase this one in the future, and i am linking to a similar mask. Don’t worry, this mask smelled like lotion not donkey milk. This mask was made of thicker cotton and was covered in a lotion cream type essence and not the usual watery essence. The mask fit well and my skin was very soft -even the next morning. I will definitely repurchase this mask. All three masks that come in this line are great. Got this at Marshalls but I am linking to similar mask. I used when I had a pimple, it was soaked and full of essence. It was made of a thin cotton, with a typical essence scent. This mask is similar to the Welcos one as they both contain volcanic ash/clay. This mask had a faint berry smell, more like a raspberry yogurt . The mask was saturated well. and made of a thicker cotton that fit well. The mask is just your typical sheet mask for moisture. Linking to a similar mask. I loved this mask. It had so much jelly essence on the mask and a ton left over in the package. The mask was cooling when I used it after getting a sunburn.The mask had a clean smell and was made of thin cotton. My face was much softer after use. I would definitely repurchase this. This mask fit well, and had typical essence smell. It was highly saturated and made of thinner cotton so be careful when you take it out. It stayed wet for about an hour and left my skin feeling very soft. I am linking to a similar Skin79 mask. This mask was literally dripping with essence. The fit was good and the mask was a medium thickness. I used this when I was sick so not sure if there’s a smell. Skin was moisturized the next morning. Use this link for 10% off! I really liked this moisturizer. It was a gel formula, as opposed to a cream and I feel that it sunk into my skin well. It left my skin feeling really soft and was great for when I had irritated/sunburnt skin. This body wash smells great, and leaves skin feeling really soft. It’s huge and a great value. I will definitely repurchase in the future. I literally had this blush/highlighter powder forever. This little jar lasts forever. It adds the perfect amount of sparkle and blush color to cheeks. I am already using the back up I purchased, and as long as I can find these in stores I will keep repurchasing. It is hard to know the long term results because this was a sample. I used this when I felt a blemish coming on. There wasn’t really enough in the packet for my whole face. The mask has a licorice and herbal kinda smell, it dried quickly and got tight on my face within 5 minutes. It had a cooling sensation. To be honest, this mask is really pricey so I probably wouldn’t purchase the full size. This candle smells amazing!! I have been buying this candle for years. I love to use this when I’m sick as it sometimes helps to clear up my stuffiness a bit. The candle lasts a long time and as long as you cut the wicks it burns clean. You can usually get these on sale. I’m pretty sure this candle was a soy one, and had a very clean burn. I found it at TJ Maxx. It reminded me of the old school Bath and Body Works “Sweet Pea” scent. It smelled really nicely and lasted a long time. I featured this micellar water in my post here: Friday(errr… Sunday) Favorite: Micellar Water 💦 I liked it and have already repurchased more at Marshalls. I liked that it was made in Italy, and I felt it took dirt and makeup off well. As with every other month, I’m obsessed with this deodorant and constantly repurchase. I am linking a similar option below. This is a constant repurchase for me. It’s cheap, smells nice, goes on smoothly, and is hopefully doing it’s job. I don’t quite have wrinkles yet, but I use this as a preventive measure. For that reason, it suits it’s purpose at a great price point so I will keep on buying as long as I can find it! These are a constant repurchase for me. I really like how cooling they are for under the eye, and I feel they do take the puffiness down. This perfume is a classic. I wore this all the time in middle school, and I brought it back a few summers ago after smelling it on a few friends. This perfume is actually an eau de toilette, but it seriously lasts all day long. Plus, it can be found recently priced. I’ve already purchased another bottle. I think I got this one at a Walgreens. It wasn’t the best felt tip eyeliner pencil I’ve used. To be honest, I have another one to try out and see how I feel before I really give an opinion. This foundation has a very light to medium coverage. It leaves skin looking dewy, so if you are someone prone to oily skin then this may not be a good fit for you. I felt like the product in this cushion went really quickly, so that was one con. Otherwise, I did like the finish it left on my skin. I purchased this at Marshalls/ T.J. Maxx. To be honest, I was not a fan. The sponge was a bit hard and didn’t absorb water well. I wouldn’t recommend this. I will be doing a post soon on the original Beauty Blender vs. some affordable options and which would be good dupes or not.